BETAR Focused Vibroacoustic Sound Therapy systems are the ultimate in deep relaxation. Users lie on a comfortable dual-density memory foam cushion while their favorite music washes through them, takes them for an audio ride that is as exciting, as tranquil, or as joyous as the music they select or is provided by the operator. An array of speakers focused along the midline of the body allows users to literally feel the music as the sound waves pulse through them in complete comfort without excessive volume. BETAR riders consistently report feelings of complete relaxation by the end of their sessions. Like ripples on a pond, the sound waves delivered by the focused speaker array resonate outward through every muscle, organ and joint in the body - a gentle music massage that melts away deeply-held patterns of tension, stress and pain. Riders float away from the cares and concerns of everyday life, a visit to a personal musical sanctuary where healing can take place. Seventy-five to 90% of all doctors’ office visits are for stress-related ailments and complaints. Stress is linked to six of the leading causes of death: heart disease, cancer, lung ailments, accidents, cirrhosis of the liver, and suicide. The Occupational Safety and Health Administration (OSHA) declared stress a hazard of the workplace. In terms of lost hours due to absenteeism, reduced productivity and workers' compensation benefits, stress costs American industry more than $300 billion annually. A BETAR ride is as a highly effective method of eliciting positive emotional and physiologic changes. A study at the Ella Milbank Foshay Cancer Center at Jupiter Medical Center, Florida, evaluated the impact of a Standard Edition BETAR system on reducing patient pain and the symptoms resulting from cancer and cancer treatment. The corresponding study of a group of 27 patients between the ages of 33 and 78 revealed a 61% to 74% decrease in pain and symptoms. A BETAR ride is the ultimate musical experience. Music lovers are thrilled to literally feel every drum beat, horn note and the vibrations ringing from the strings on guitars and violins in their favorite songs and symphonies. BETAR riders can experience every great performance that has ever been recorded as if they were on stage with the artists, to feel the music in a way far beyond any listening experience. Many BETAR riders experience rich emotional responses beyond what could be expected from a mere listening experience as old physical and emotional trauma is released from deep within the muscle memory, leaving the rider feeling refreshed and reborn. Many riders simply come off grinning from ear to ear, renewed and rejuvenated. 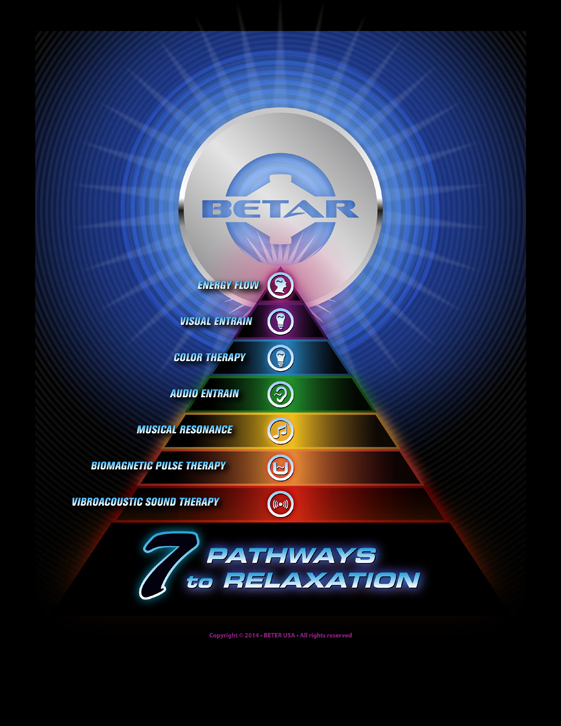 The BETAR Mood-O-Matic® Mood Tones stimulate the body’s natural energy centers. In the past Eastern practioners used chanting, gongs, and other musical instruments to increase the flow of energy through the chakra- energy vortices that connect the physical body to the universe of living energy that illuminates us all. Just as a flourescent bulb will begin to glow when stimulated with electricity, the chakra will resonate to a higher state of activity when stimulated by resonant tones. in this way. The Mood-O-Matic Mood Tones do this electronically by delivering seven soothing sound waves to the speakers in the array. Six of the Mood Tones activate the six lower chakra - all but the crown. The speakers under the legs are driven by the Schumann Earth Resonance Tone - 7.83 cycles per second. This low alpha RELAX Tone serves to keep the experience grounded while encouraging a state of wakeful relaxation. The BETAR focused speaker array gently pulses the body's nervous system with a magnetic field. In addition to creating the sound waves, the speakers in the focused speaker array produce a field of magnetic energy that pulsates in perfect synchronicity with the music. This magnetic field stimulates every part of the nervous system, the bio-electrical network of nerves and pathways that connects the brain to every part of the body. The magnetic field also provides energy to the aura, the body's natural electrical/energetic field. Invest in the health and well-being of yourself and your loved ones with a BETAR Focused Vibroacoustic Sound Therapy system! Like all BETAR products, our Vibroacoustic Therapy systems are covered by our 100% satisfaction guarantee. Return them undamaged within 30 days and we will refund your purchase price with no questions asked.